In a large bowl, whisk together the flour, baking powder, baking soda, salt, and spices. In a medium bowl, whisk together the molasses, eggs, sour cream, milk and butter. Add the wet mixture to the dry ingredients and stir until combined. Brush the griddle or skillet with melted butter. Spoon 1/3 cup of batter onto the cooking surface for each pancake. Cook until bubbles appear on the top of each pancake and the underside is golden brown, about 1-2 minutes Using a spatula, flip the pancakes and cook until the underside is lightly brown, another 1-2 minutes. Serve immediately or keep warm on a heat-proof plate in a 200º F oven while you finishing cooking the remaining batter. 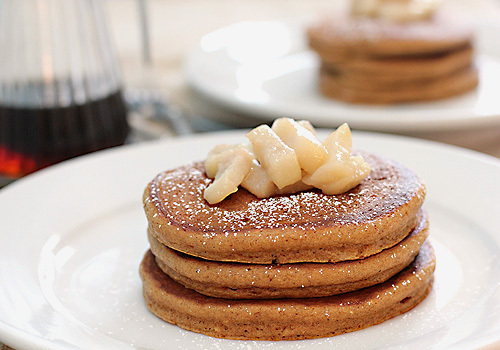 Serve with sautéed pears, confectioners' sugar and lemon infused maple syrup (recipe below). Enjoy! In a small sauce pan, bring syrup and lemon peel to a boil. Reduce the heat to low. Cook for 10 minutes. Remove the lemon and serve warm. 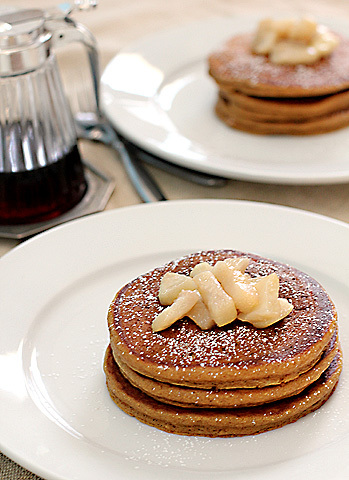 Source: Pancakes adapted from Gourmet, Lemon Infused Maple Syrup from, The Galley Gourmet. I have been obsessed with all things gingerbread this year, and these pancakes look gorgeous! I love the addition of pears and the lemon-maple syrup. YUM! Thank you:) The lemon-maple syrup really makes the dish. Hey Nicole -- I think Pat is planning on just showing up at your house to see if you have any leftovers! This recipe sounds scrumptious. I may just be whipping up a batch myself for Sunday breakfast. Thanks! I love gingerbread, but have never had it in pancake form. Now I will! Thanks. You are welcome:) I hope you enjoy them! oh wow, i just love the fluffiness of these you had whipped up! Probably because of the spices? Haha...at least they were yummy! My family loved them! They were light and fluffy and just like gingerbread! Thank you for the recipe. This one is going into the pancake files :) I didn't make the infused lemon syrup because I use a raw maple syrup and heating it to boiling would negate all the lovely nutritious minerals. I'm thinking next time I'll boil a small amount of the syrup with the called-for amount of lemon, cool it down, and add it to the unheated syrup. I really want to add the lemon to this. So glad you and your family enjoyed them!